Apple has sent out media invitations for an event scheduled for September 10, shoring up rumors that next Tuesday would be the day Apple unveils some new hardware. The event is scheduled to take place at Apple headquarters in Cupertino, California, and begin at 9 a.m. pacific time. Apple is no stranger to including subtle hints in their media invites as to what we might see and this year is no different. 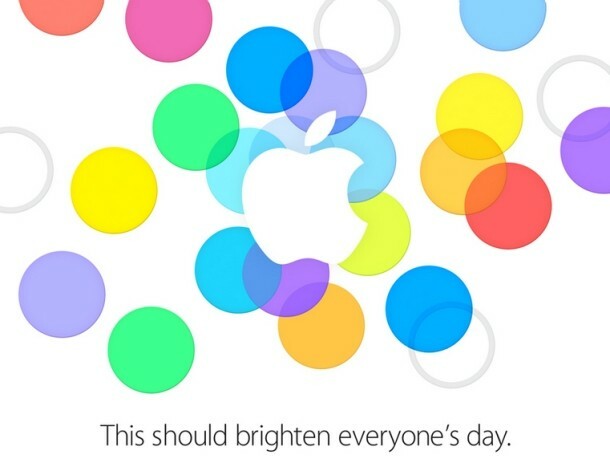 The tagline “This should brighten everyone’s day.” is no doubt a reference to the rainbow of colors that we can expect to see on the low-cost iPhone 5C – photos of which have already leaked online. The budget iPhone 5C has in many ways overshadowed what will be Apple’s flagship device for the coming year, the iPhone 5S. The latter device is expected to ship with a better quality camera, improved internal hardware, more storage (up to 128GB) and a new gold color option yet all we’ve been hearing about lately is the 5C. Photos of the cheaper smartphone adorned in plastic packaging surfaced over the weekend in a variety of colors including pink, white, blue and yellow. The iPhone 5C is expected to retail for less than $400 off contract. It’s unclear at this hour if Apple will offer a live video stream of the event over the web. They didn’t do so at last year’s iPhone event but they did for the October iPad mini event as well as WWDC back in June.